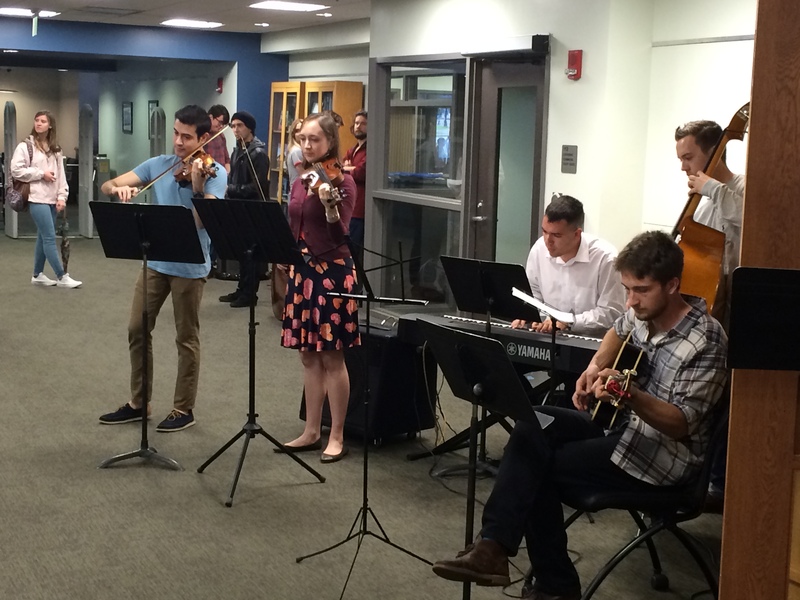 Students from my “Introduction to Music Entrepreneurship” class at the College of Music at Florida State University gave a “pop up concert” yesterday (Wednesday, February 22, 2017) in the Strozier Library at the heart of campus. Music included original arrangements of pop songs as well as a handful of classical selections. Several weeks ago, the students formed small teams that were responsible for planning and performing the music, creating marketing materials, preparing and distributing audience surveys, and producing audio and video recordings to help promote the course’s next pop up concert. 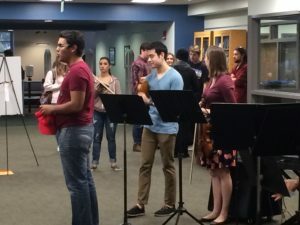 Students will give two more pop up concerts this semester, and they will use what they learned from the first to try to improve the second and third concerts. Each pop up concert is a chance to practice basic marketing strategies, project management skills, and audience development approaches, as well as to draw attention to the College and to share information about the College of Music’s upcoming events as we engage with the audience members. I am enjoying seeing the fruits of my students’ labors as they take to heart and practice the ideas we are discussing in my course. In the link below, you can also read about one of those students, Jose Hernandez, as he attempts to compose, perform, and record a new piece every day in February. Jose also shares what he has gleaned from the course.